A camo travel bag is an essential for hunters, fishermen and outdoor lovers and the Rickshaw camo duffle is the perfect accessory. As outdoor lovers, we need some accessories to hold all of our stuff, especially when we’re traveling long distances on flights or hunting and fishing trips. The Rickshaw Bagworks Square Duffle is the perfect bag for any trip and looks great for outdoorsmen in the camouflage color-way that they have designed it in. With over 1600 cubic inches of space, it’s big enough for tons of your belongings and still meets the stringent TSA requirements for a carry-on bag for flying. 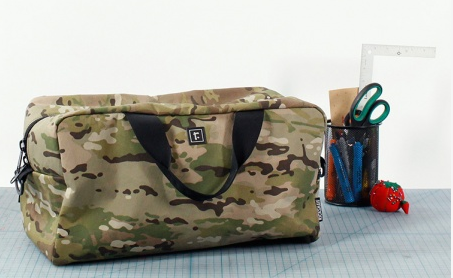 The camo color of the Rickshaw Square Duffle Bag is going to hide plenty of dirt. But since we are sure that you’re going to want to clean it eventually, you’re lucky that it’s machine washable. The bag is extremely light, so you won’t have any added weight and it’s very durable. Built of waterproof X-Pac nylon, the bag will keep all of your belongings dry and it’ll be a hard task to rip this in half. Whether you’re running through airport security or dragging your camping essentials up a mountain, the Square Duffle from Rickshaw Bagworks is the choice you can’t afford not to make. You can purchase your Rickshaw camo duffle bag on their website here for $129. Check out other cool outdoor gear reviews to solve all of your purchasing conundrums.